The penultimate homestand of the regular season ends today and this afternoon’s game will determine whether this is a tolerable 4-3 homestand or a disappointing 3-4 homestand. Man, losing four of seven to the White Sox and Tigers at home would really stink. Even winning four of seven would feel kinda like a letdown. Whatever. It is warm and cloudy in New York today, but there is no rain in the forecast, and that’s all that matters. This afternoon’s series finale will begin at 1:05pm ET and you can watch on YES. Enjoy the game. Boone Suspended: Aaron Boone has received a one-game suspension and an undisclosed fine for Friday’s ejection tirade, MLB announced. His cap made contact with the umpire at some point and making contact is an automatic suspension. Boone is serving the suspension today and bench coach Josh Bard will fill in as manager. 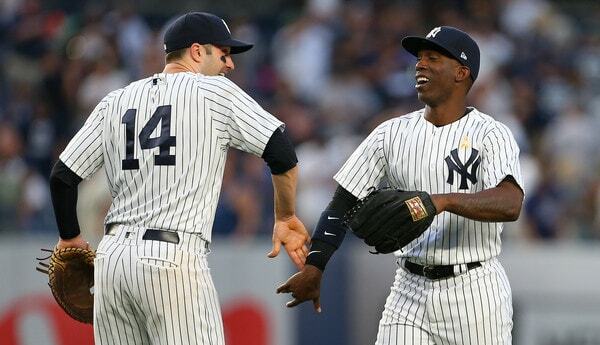 Injury Update: Didi Gregorius (heel) took batting practice and ran the bases today. It’s more likely he’ll return at some point during the Mariners series late next week rather than the upcoming Athletics series … Aside from the ongoing hamstring issue, Giancarlo Stanton is fine. Adding McCutchen and getting Sanchez back allows the Yankees to finally give Stanton a day to rest. He’d started the previous 84 games. Roster Move: Welcome back, Jonathan Loaisiga. The Yankees have called Johnny Lasagna up from Double-A Trenton, the team announced. He was scheduled to start today. There are now 31 players on the active roster.